A week and two days after I last wrote in my notebook, finally I'm picking it up to write again. Where have I been? I've been sick. Really, miserably sick. It was just a virus of some sort — I won't be graphic. I spent so many hours in a crowded park, in close proximity to so many strangers, I should have known it was only a matter of time before somebody shared their germs with me. Of course, there are few things worse than sickness in summer, especially when it's hot, which it was. For a few days there I swear Neopia Central was in the grip of its worst heatwave since... uh, whenever its worst heatwave was. The air was stifling, and dry, and still. And I was stifled, and not dry, and forced to be still. It was like prison. In Moltara. Or worse. Then it rained once and cooled everything down — hallelujah. The day after the rain was windy, but I couldn't go out. My virus was prolonged, and honestly, I was too weak to get out of bed. I missed four windy days in total. At first I was antsy, but then I started to think... that maybe this was okay. I had collected sufficient data, I had done what I'd set out to do. Perhaps this was meant to be the slightly-less-than-grand finale of my adventure. Perhaps it was time for me to bring my kite-scapades to a humble close. But then I realized I would miss it. I already did. It really had been an enjoyable few weeks at the wind's beck and call. I had met so many interesting people whom, through the wonders of something as simplistic and innocent as flying a kite, I had gotten to interact with in different ways and on greater levels than I had ever imagined. It was enlightening, enriching, rewarding. And besides, what would I do with the kite if I were to stop altogether? Little Red has been part of me for so long (Some of my soul is probably still in the fabric!). I don't think I could bring myself to just throw him-- I mean it, away. The 23rd day of Swimming brought with it a strong summer wind. The sky was deep, deep blue, its vibrance accentuated with the occasional swirl of white, wispy clouds. And when the world looks so darn inviting, and you finally have the strength to be out in it, there's nothing you can do but heed its call. 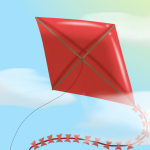 "Couldn't ask for a better day to fly a kite, eh?" At the park people played noisy games. There was a notable amount of laughter to be heard, and the myriad voices of friendly, carefree chatter far exceeded the norm. It was like I was surrounded by kids' birthday parties at every angle — except it wasn't only kids who were having fun. Five different people said hello to me as I made my way down the winding park paths. I saw a total of seven kites in the sky. "Nice to see you again." I had come to my regular spot, was knelt down on the grass unzipping my backpack, when I heard a voice behind me. I turned around to see a pair of crystalline indigo eyes; the cloud Poogle who fell from the sky; Jackson's mom. "The park has missed you." "Hey," I greeted her with genuinely-felt warmth. It might have been the effect a week and two days of solitude can have on a person, but I was so glad to see her. So glad. I straightened to a stand and turned fully to face her. "Yeah, I've been pretty sick." Totally comfortable, this was the greeting that rolled inadvertently out. "Sick?" The ponds opened up, like I had only seen once before. They could have swallowed me whole with the expression of candid concern they exuded. "Just a virus of some sort. Laid me up for a week, though." ...Suddenly it computed what the lady had just said. "The park's missed me?" She smiled, shiningly. "Rumour has it that a brown Ixi has been spotted here every windy day since the late days of Relaxing, flying a red kite," she reported in practically a whisper, eyes moving furtively between me and my now open backpack on the ground. "The rumours are true," I said. "Who's spreading them, if you don't mind my asking?" "A pretty large portion of Neopia Central's population, I'd say!" The Poogle laughed. "My coworkers were even talking about the unusual brown Ixi at the park. I thought the description sounded familiar!" "What else did they say about me?" I asked the Poogle, that inherent childish, praise-seeking brand of curiosity that gets the better of us all, working on me. "They were just speculating as to what you might be doing," she said. "Some of them had some really crazy ideas... One of them thought the kite was some kind of weather balloon, if you can believe it... Someone else said you were trying to get video footage of the whole park from an aerial view — some kind of 'government scandal'." She made quotations with her fingers. "And what do you think?" I inquired of Jackson's mom. I wanted to know what she thought of me, honestly. I wasn't going to be shy. "I know you said you just do it to clear your head." "And what ideas did you have of your own?" The Poogle bit her lip, almost apologetically. "That you just want to see what kind of reactions you get from people?" There was a barrier, once. A wall that separated me from the rest of the park, isolated me, kept me in my own little bubble; a glass room for others to gaze into, though the room's sole occupant was affectedly unaffected by their stares and their knocking on the windows, choosing instead to go about his work in a business-like manner, carrying out his mission, never veering to the left or right... until the proper time would come. It came now. She got me. The barrier had been broken. "Exactly!" I beamed, and the Poogle didn't smile, like she thought I was making fun of her. I'd met her before, but I hadn't asked her name and she hadn't asked mine. But with the wall's glass panels shattered and once-and-for-all fallen down, I felt it was time the whole park received a proper introduction. "Ben Fitzgerald, Central University, Sociology department." Veil lifted, the eyes I thought were like crystal were now pure gold, like unto clear glass. "This is a social experiment!" she exclaimed, everything coming together now. "Of course! Of course it's a social experiment!" She threw her head back, squeezed her eyes shut, and laughed mirthfully. "So, what have you leaned?" she asked me, every iota of hesitation or reserve now washed away. "Or, even better question: what have they learned from you?" Now she was taking a page out of my book, playing the wise, cryptic old sage. "Things have been different around here. They're subtle differences, but they're differences. I don't know exactly what it is, Ben. People just seem happier." There was no denying this was true, but to think that I was the one to singlehandedly bring about this incredible change would have been the superlative exhibit of egomania. "It wasn't me who taught them, ma'am," I told her," it's what I stand for." "What do you stand for?" She tilted her head as if perplexed, but there was something reverent in her demeanour that made me think she was ready to hear and believe anything I said. "I'm defying the norm," I told her. "I'm breaking the restrictions society has set that say a grown man can't play like a child. What's wrong with an adult flying a kite? In Shenkuu they extol it! They have a whole festival for it, for crying out loud! But in our culture it's almost frowned upon, and for absolutely no reason. If you get enjoyment out of something, so long as it's not harming anyone, why shouldn't you be able to do it, and do it freely? If an adult wanted to play tag or hide-and-seek, why shouldn't they? There's nothing weird about seeing guys throwing a football around, or a frisbee. Why are some games taboo for anyone over ten, and others aren't?" She listened in silence, nodding slowly. "It's like a testament to the ideology of being yourself. Historians probably don't even know when and why and how these seemingly baseless rules of society came about. Culture does more than shape us; it tries to get us all to conform, so that the masses are one body — which can be great in some respects, but at the risk of totally forfeiting individuality? Society, or whoever or whatever-the-heck makes the rules, would have us all look the same, and talk the same, and act the same... We the people have to fight to retain our right to be different. We each need to create our own, individual 'culture'. Sometimes it can be a matter of one person setting the standard--"
"One person does something out of the ordinary," the Poogle took over, "and if they do it consistently and devotedly, and enough people catch on..."
"They can change a Neopia Central park, frequented by thousands," I finished. I had let my tongue loose. I hadn't preached my Fitzgerald manifesto like that outside the classroom, ever. But for some reason today the words just came. It was the climax of my mission. "When one person acts openly," I continued, softening my tone, "without worrying about what others think, other people will — whether it's a conscious thing or not — start to emulate their behaviour. It's like, you know, 'This guy can do it, why can't I?' Sometimes one person's presence, if endowed with enough conviction, can influence the world like... like you have no idea." "I have an idea now." She grinned, turning in a circle, opening her arms as if to say, 'Look! Look at the world around you! ', and embrace it. We stood and talked. When twenty or so minutes later the winds died down, and showed absolutely no signs whatsoever of coming back, it occurred to me that the Poogle must have had someplace to be. "No, actually." She laughed that signature laugh, shyness returning. "I just came to talk to you. It was so windy I figured you'd be here. Or I hoped you would be..."
There was still so much more to say. "Do you like coffee?" was the thought that manifested itself first, and I latched onto it. "They have tea at the Coffee Cave, don't they?" "How about something iced?" She smiled. "It's still hot out here." I'll spare you the details. It was a da-- deal. My new friend's name is Alyssa — a pretty, breezy name, in my opinion, like a breath of fresh air. She told me her last name is Striving, and as soon as I put Alyssa and Striving together I recognized it as the name of a Neopian Times reporter whose articles have been gracing and shaking the 'Around Town' pages to their very core since Year 8, or therein. ...You know where this is going. She asked if she could do a story on me. Actually, what she says she wants to do is publish my whole flippin' report! I told her yes, yes she can. My kite is a conversation piece. It started as an experiment, but now it is truly soul-invested. It is an object of prejudice, but also ways and means of connection for a community that was once so distanced. It is freedom and confinement, an allure and a repellent. Its significance, in terms of scope and meaning, is subjective; it means something different for everyone. Though for me it is a symbol of individuality, of expression, of the native right to break the mould, and the courage it takes to do so. It is a beacon, a heartfelt invitation for each and every one of us to be who we want to be, regardless of what the world's initial reaction might be. » There Goes That Man and His Kite!